Bottom Line: sturdy speakers that have solid power and an excellent response range for a two way bookshelf speaker. Large and heavy. Kind of dated now, with no apparent MSRP discounts – they’re expensive and not the greatest value currently. The Ultra speakers have been SVS’s premium home theater lineup for several years now, and it consists of a single pair of eponymous bookshelf speakers which we’re reviewing herein. It’s an unabashed behemoth insofar as two way bookshelf speakers go: they weigh 19 pounds each and are quite large, though the bottom surface area does at least still manage to be somewhat compact. They’ll need a sturdy surface to rest on, with room in the back for the port to breathe. The size/weight is in part due to the unusually thick and geometric cabinet. While most bookshelf speakers are simply a box, the Ultra’s cabinet is, according to them, painstakingly designed to minimize resonance as much as possible. The tweeter is a standard 1 inch aluminum dome that’s housed in a large plastic basket and actually has its own metal grill to protect it. Immediately apparent is the high response ceiling – though you might think it doesn’t matter since humans can only hear up to 20k Hz, the additional benefit is the implied range increase on the other end. This allows for the woofer to focus more on the mids and lows, which is a usual limitation of a 2 way bookshelf speaker. All in all, what you get is a response range that’s excellent. 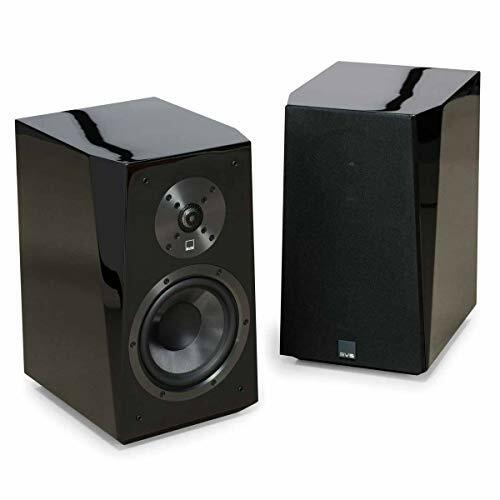 While most smaller bookshelf speakers sound inadequate without a subwoofer, these could certainly suffice independently. Though SVS does make some one the most popular and well regarded (albeit expensive) subwoofers on the market. Power wise these are decent, but not massive. A ~50W rms, 87 efficiency rated speaker will get plenty loud at midrange, but might not suffice in a full fledged home theater system. For that purpose, we imagine the Ultra Towers (reviewed here) are intended to be the main satellites. Aesthetically they look somewhat dated because, well, they are at the time of this writing. You don’t see the piano finish too much anymore, though they do come in a wood or white finish as well. SVS has a 5 year warranty on all its passive speakers which is pretty top of the line coverage, and also an unusually generous 45 day return policy so you can really give them a try to see if you ultimately like them or not. SVS makes good speakers, but they’re pretty expensive. It’s a little disappointing to see that these haven’t really become cheaper since their initial release circa 2013, but maybe they yet still will get discounted? Might be worth keeping an eye out. The main issue is that a lot of competitors have subsequently been released that are as good or maybe even better for less money. Also worth note is that these are overkill and likely too big and heavy to be near-field desktop speakers. Check out the links below for some more modest alternative recommendations.